If you buy a $20 toaster that goes kaput after a couple of years, you probably don’t think twice about tossing it and buying a new one. After all, that seems like a pretty good deal. But Peter Skinner wants to change that. He wants people to imagine where all those toasters end up and, instead of continuously adding to the waste stream, choose to have those broken appliances repaired for free. After reading a New York Times article in 2012 about an initiative in the Netherlands called Repair Cafe, Skinner decided to act. The organization puts together events around the world at which community volunteers pitch in to repair appliances, electronics, bicycles and more so they can be reused rather than thrown away. “I thought it was a cool idea,” Skinner says. Skinner, a chief financial officer for tech companies, founded the first U.S. affiliate Repair Cafe in 2012 in Palo Alto, California. He heads the all-volunteer organization, which hosts quarterly events where people can bring in their lamps, bikes, stereos, clothing, jewelry and, of course, toasters for repair at no cost. 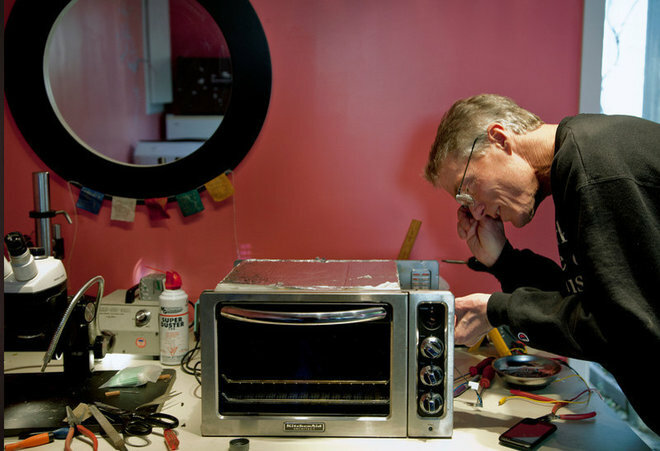 Here, John Eaton, a Repair Cafe co-founder, dives into a small convection oven. Date: Sunday, August 30, 11 a.m. to 3 p.m. 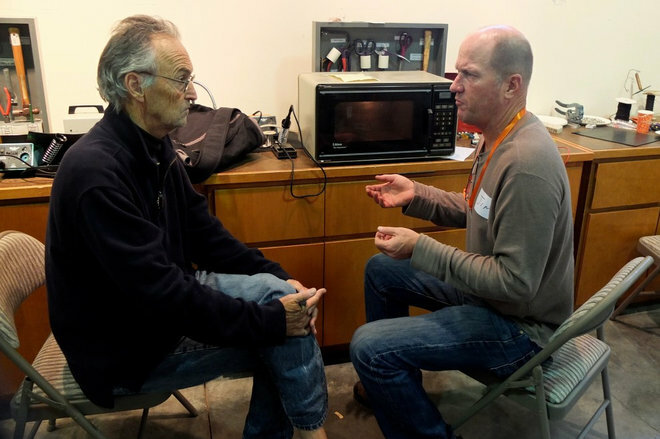 Here, Jim Wall, chairman of the board of directors of the Museum of American Heritage, chats with a visitor about his microwave. Each event has about 40 volunteers, two-thirds of whom are the hands-on fixers. A lot of the fixers have been in the tech industry in Silicon Valley for many years. One’s a Stanford professor emeritus of physics, another is Dan Kottke, pictured above, an early Apple computer engineer who helped assemble and test the first Apple computers. 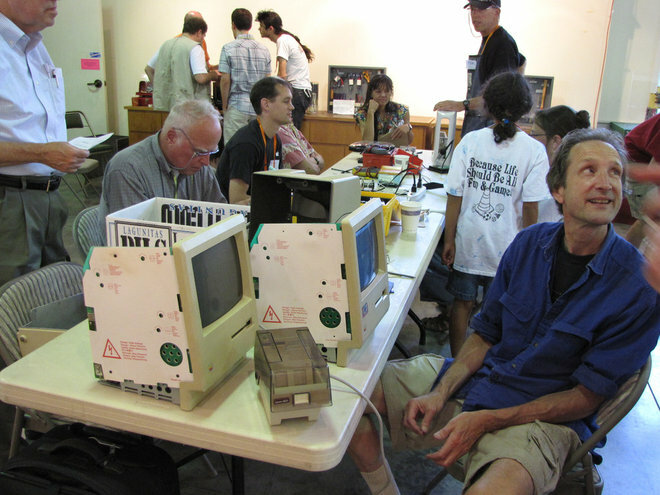 At a Repair Cafe last year, Kottke helped fix someone’s vintage computer, and even ran home and got his own to show off. “Only in Palo Alto can you have an experience like that,” Skinner says. Anything with a circuit board is more complex and difficult to fix, Skinner says. Microwave ovens are one of the most common items brought in, but Skinner says they’re hard to diagnose and dangerous to fix. Nevertheless, he says, the volunteers have a pretty good batting average: About two-thirds of what comes through the door broken leaves fixed. “That’s not bad, in my mind,” Skinner says. 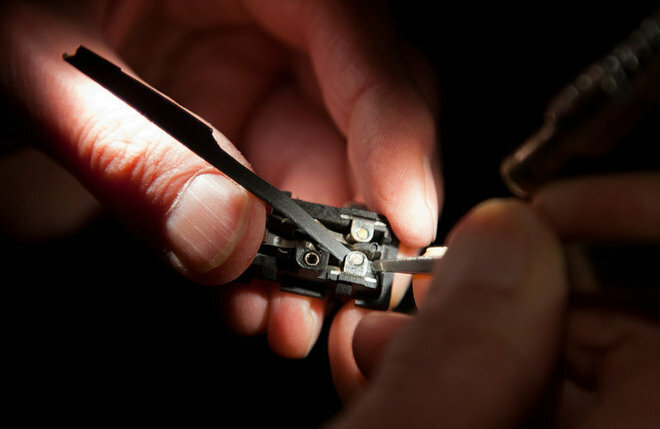 Shown above is a volunteer exploring the contacts of an electrical fitting. Other people come in for economic reasons — to have an appliance fixed for free rather than buy a new one. Others just want to hang on to something that’s been with them forever or reminds them of a loved one. 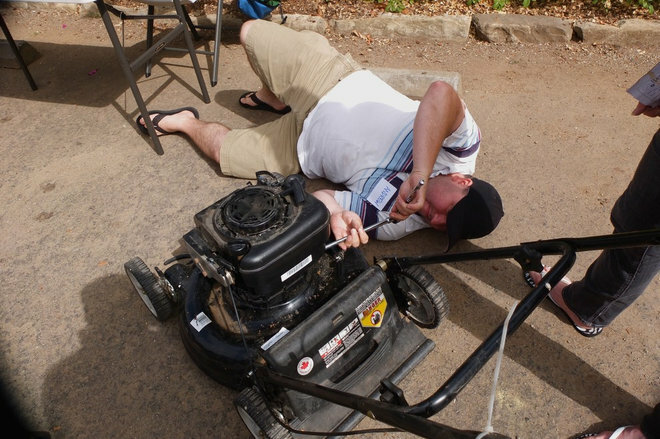 Above, volunteer Andrew Shelton, an employee of Greenwaste, resuscitates a lawnmower. Of course, there’s a fair share of uncommon things that come through the door, like a mechanical chicken or a lava-rock water fountain that arrived pulled in a big red wagon. Here, volunteer Joe Margevicius diagnoses a printed circuit board with a volunteer apprentice. 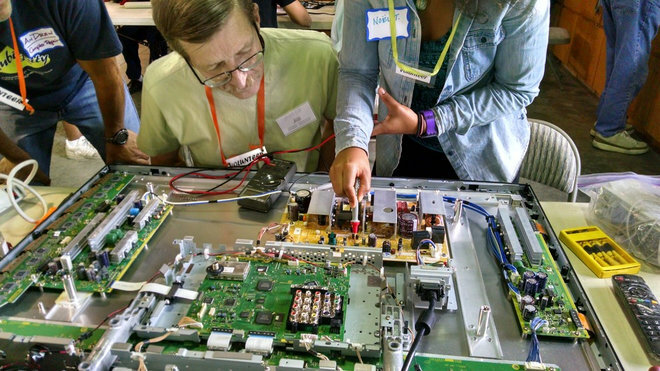 Visit the Palo Alto Repair Cafe website for more on this event, or visit the main site to check for events nearest to you. Are you a tinkerer and fixer? Please tell us what you fix!